After seeing magnificent pieces like this emerald-tipped turban jewel, the AGO's gift shop offerings of Indian-themed jewelry were uninspiring for this rani. Sapphires the size of a plum are beyond consideration, but I admire and can afford Indian silver, so I searched for some pretty, not precious pieces to add a touch of the exotic to a winter wardrobe. 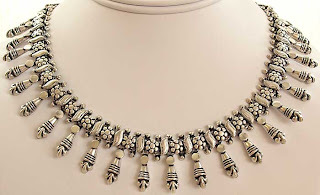 Indian tribal silver necklace, 16 inches long, from eBay seller Heritage Trading, for whom I'll happily vouch. Starting bid $125. This item is #60536662941; see listing for more views. 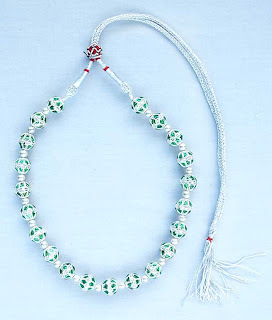 Also from Heritage Trading, a green enamel and silver necklace, adjustable from 14 to 20 inches. The decorative slide at the back is just as pretty worn at the front. Starting bid $44.99; item #160537163317. Pearls were beloved of Indian princes, worn in multiple ropes by men as well as women to signify wealth and purity. 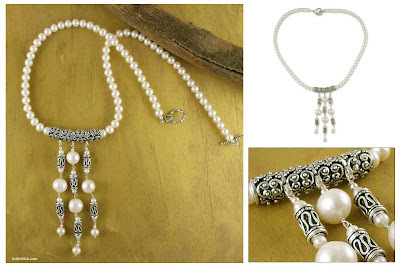 Novica artisan Kalyani Gupta made this "Aura of Purity" necklace of pearls and sterling beads. The necklace part is 18.5 inches, and the pendant adds another 3.5 inches. 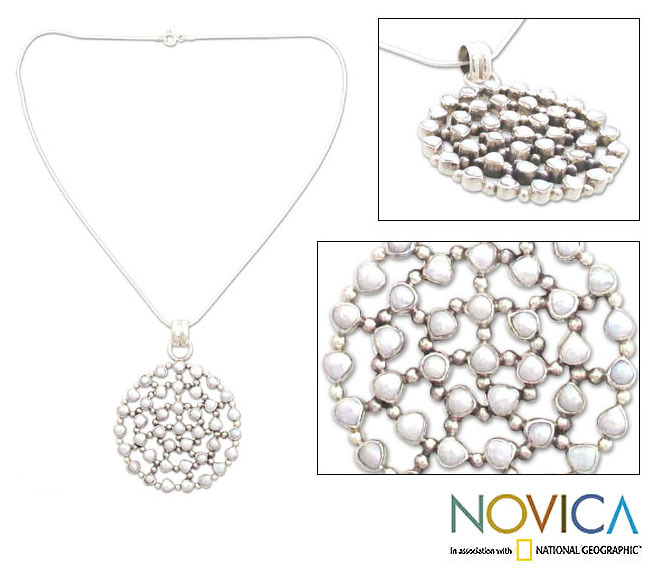 Price, $174.95 from Novica. Here's another pretty pearl piece, a silver and pearl "Constellation" pendant from Novica seller Bhavesh. It's neither traditionally ethnic nor antique, but I find it gracefully pleasing. The pendant is 2.6 inches by 1.9 inches and comes with a 15 3/4 inch silver chain. Treat your friend, sister or self; price, $82.36 plus s&h. 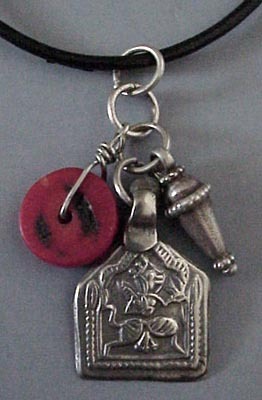 An evocative amulet of Hanuman, the Hindu deity, paired with a coral bead and a detailed silver bead, hung on a leather cord. Price is $135 from Nomad's Journey. One could wear an old silver amulet or spend the same for a piece of Banana Republic tat–easy choice! Antique pieces do not date like many contemporary designs; they evoke a past infused with mystery and artistic integrity. Buy them now to feel like a queen, and enjoy a piece of history for years to come! Love that amulet, and you make a great point about these sorts of pieces compared to BR. I like the Novica works directly with the artisans. I love these, and also silver from the Arab world - Arabic designs from Egypt, Berber jewellery from North African countries. Alas I lost my favourite, heaviest and most elaborate silver bracelet (Egyptian). A warning that often it is worthwhile to add a modern silver chainette to artesanal clasps! I lost it in Amsterdam; hope a deserving person found it, that it didn't fall into a canal. pseu, I've found nice pieces of this kind in Italy. I do appreciate antique gems...and to see them gathered together in a museum must surely fuel the desire to acquire! Love the amulet and the pieces you show. I like the character of old silver and you make an excellent point. 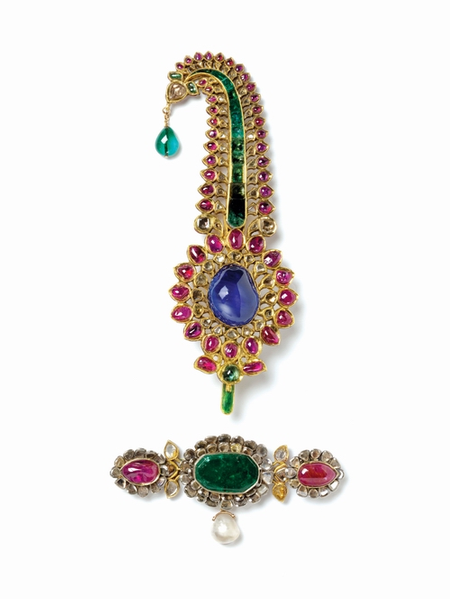 Apropos Indian silver jewelry, you might like to read "The Traditional Jewelry in India". Right now I'd like to start collecting Indian kada diamond bangles in gold over silver. I think that they look great with everything from jeans to a LBD. Pseu: I've had great service from Novica! hostess: What was in the exhibit was of magnificent quality, but it does build the eye! 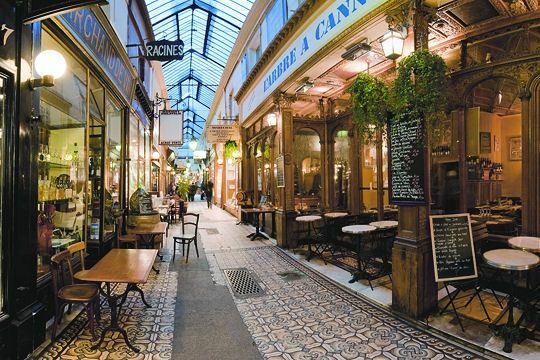 mardel: Old silver of other countries is beautiful, too, and still relatively affordable. Belle: Yes, would like to read. Diamond bangles are so versatile! LPC: Oh no! I'll be posting more on silver soon, but not, alas, for you. spacegeek: My usual standard for choosing jewlery is "Can I wear this with a black (or neutral) v-neck swesater and pants?" If a woman wear that kind of basic, even jeans and a white tee, it will work. If she wears "hard prep" (cabled crew necks, mens' styled khakis, buttondowns, anything with lobsters on it) no. 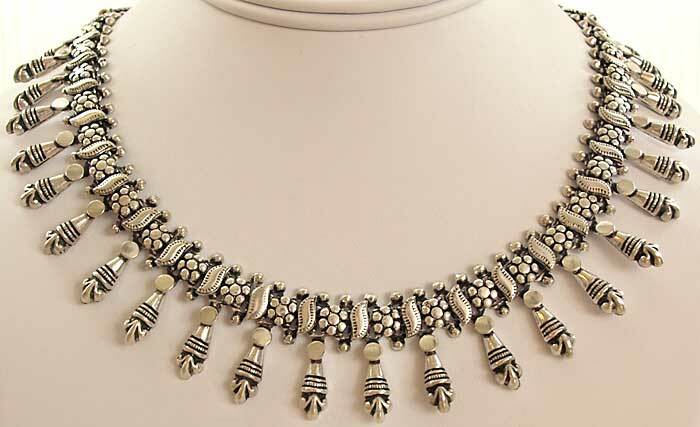 One doesn't have to wear boho clothes to wear ethnic jewelry but there are styles with which it clashes. All; My replies to your comments are unusually full of typos. That will be usual for the next while! I have four workmen in the house today, navigating around me as I post. I have a collection of Indian jewelry from a couple of trips to India and I love wearing them. They really make my outfits. I know this is offtopic, but I am new to this site and was browsing past posts. I own quite a lot of Talbots linen and always wash it on gentle, hang to dry and iron. I have clipped out polyester lining when not needed. Talbot's petites usually fits me perfectly. I had a similar experience to yours after visiting the Topkapi Jewels in Istambul. Nothing inspiring in their gift shop either, but I scored in the Grand Bazaar. I love that pearl pendant -- it's a Rubi piece, for sure. sharon.king: Thanks; I don't know why they line it and then insist on dry cleaning. IMO, not very customer-aware. 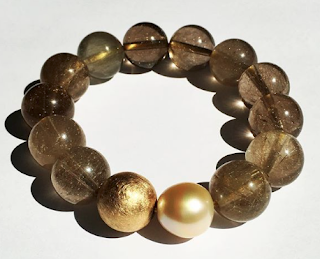 Very interesting blog about jewelry photographer. Women reliably need to take the new example. They find the uniqueness and built up things. The newest best ornaments are Marvelous Anklets. 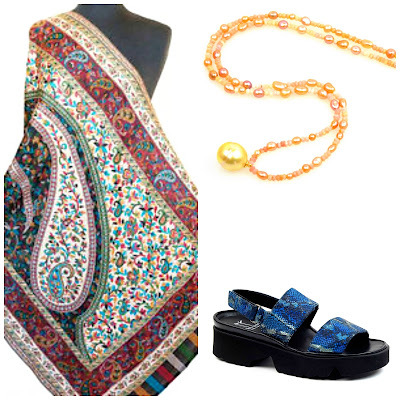 It can wear with any kind of spruce up whether is the western dress or formal dress. Visit to orchestrate the mesmerizing one.